I have a Corgi that barks. A LOT. He barks at the doorbell, he barks at people walking by our house, he barks at leaves. Why does he bark at literally everything? How can I stop this? I’m okay if he barks when he’s warning us of a valid threat, but leaves?? How do I selectively curb his urge to bark without shutting him up entirely? I don’t want him to feel like he’s done something wrong. *After getting our response from Linda, we asked her if she could give us some more information about the difference between behavioral issues and training issues in dogs. Look for her article next week, when she’ll go into more detail about when pet owners need a trainer, when they need to work with an animal behaviorist and the importance of both. I’ll be interested to see the outcome of this next week. I’m thinking about how I would address the barking myself, definitely not easy! It’s an interesting point that herding dogs are naturally barkers because they use that to help control the livestock they’re herding. Thanks for the love and biscuits! Soldier and I appreciate both, but he probably likes the biscuits best. That is some sound advice below! I work with clients that swear their dog was “born that way”, and the fact of the matter is personality is real, BUT so is human error and inadvertent reinforcement! Getting assistance from someone educated in behavior is excellent advice! We humans can make mistakes in spite of (and sometimes because of) how much we love our pets. Sometimes it takes a stern approach and some help from an expert. We have the same problem with one of our dogs barking a lot, I have started going up to her and giving her a high value treat when she stops barking, will see how it goes and if it works! Looking forward to reading your next instalment. Michelle, please keep us posted on how the training is going! I’m looking forward to the next installme t. I enjoy learning more about dog behavior so I can pass this knowledge on to family and friends. Thanks for sharing! I’ve been reading about Lola and learning from her and Lexy as well. Looking forward to the next post. Roxie has recently started barking when people approach us on the trails, even though she loves people and other dogs. I try to correct the behavior, but could very well be inadvertently making it worse by “rewarding” her with attention.. Sometimes it’s hard to know when we’re rewarding a behavior and when we’re extinguishing it. It can be difficult to ignore barking when you’re on the trails, particularly when others are around. That is some sound advice! Barking if gone unchecked for a long time does become an annoying ingrained behavior! An animal behaviorist is definitely a good idea in that case. Paroma, please check in next week, when we’ll have additional information on training and working with an animal behaviorist. Thanks for reading! Great advice and I really wish people in the park would train their dogs not to bark non stop like some do, it actually becomes unbearable to be there sometimes. My fear is Layla will learn from them so I sit as far away as possible from it. I agree. Some barking during playful moments at the dog park is fine, but a chorus of non-stop barking is uncomfortable to listen to and it can frighten more timid dogs who may shy away from playing at the dog park. Mr. N is not a big barker indoors. He alert barks at the door and that’s about it. He does tend to bark when playing with other dogs. He knows an “enough” cue for when we need him to stop! Mr. N is a true gentleman! So true and such good advice (but expensive and time-consuming to help). Kilo the Pug barks at anyone who comes near our front door, excessively. Pugs were originally prized for alerting to threats and strangers apparently so I am sure there are some genetics involved. He is a rescue we started fostering at 2 and there may have been some previous reinforcement we were told. We had so many things to work on this slid down the priorities. We had a behaviourist and I did make a bit of an effort to recondition but the territory defence got worse as he got more comfortable and devoted. He has become such a great little love bug and I know it is my fault he has not improved on this – maybe this winter. We all have those times when life and love get in the way of discipline and training. I’m glad he’s devoted and that he has become comfortable enough in his new home to really be himself. Give him a hug for me! I’m interested in reading the follow up. My sister has an Australian Shepherd who barks a lot! Perhaps you can forward a copy of the article to your sister when it comes out. But I’d include some praise for your sister as well – positive reinforcement is so important, LOL! I can see how a dog that barks a lot could be a real problem. I have 3 neighbor dogs that are next to our yard a Great Dane, a Newf, and a Shih Tzu. The Shih Tzu barks incessantly when he is outside, but we can’t hear him when we are inside. Fortunately, our dogs ignore him, whether they are inside or outside. I am looking forward to reading the next part. Thanks, Beth. We’re looking forward to Linda’s article as well! It is really interesting that herding dogs are barking dogs. I never thought about that. She is absolutely right that we often feed bad behaviors by the way we respond to them. Even with my cats, I have to remind myself that all attention can be seen as good attention. The fact that you stop what you are doing and pay attention to them lets your pet know how they can manipulate you. I have to confess that I used to respond to Soldier with attention every time he barked (and he barked at everything from the UPS truck to the wind). It was a matter of training myself, not him, and sticking with it. It was one of the rare times I actually felt like I’d won the battle when he stopped barking so much! I really appreciate Linda’s response! It’s fascinating to think about what is ingrained and what is learned behavior. I’m looking forward to your next post! Thanks! We’re very fortunate to have Linda’s input on issues involving animal care, behavior and socialization. Her experience and education make her an excellent resource. Great post! We had a corgi and sometimes its just nature!!! This is sound advice. 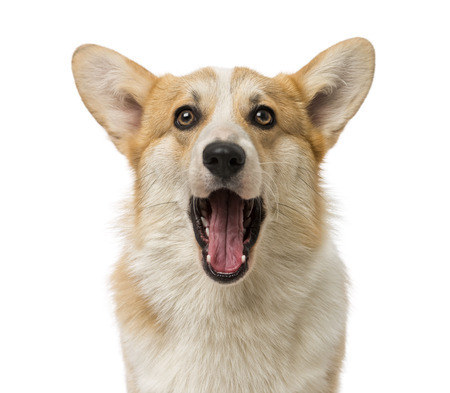 I read another article by my favorite Canine behaviorist about how to curb incessant barking on command. She has border collies who can be quite intense but, like Corgies, highly trainable. Her method has more to do with teaching an alternate behavior at the time when the dog is triggered to bark. For example, if someone comes to the door, the dog is asked to fetch a ball. Can’t exactly bark with a ball in your mouth. I’m interested in hearing more from Linda next week. I love hearing different perspectives on dog training, because every dog is unique and responds differently. Stephanie, I’m so glad you’re looking forward to Linda’s article. She always has such great advice and she really understands dogs and their instinctual behaviors vs. learned habits. I’m looking forward to learning more from Linda myself. Your friend’s habit of offering a distraction is a great way to break the cycle of barking. Thanks for sharing! I don’t have a dog however have friends with dogs. I just always assumed excessive dog barking had to do with home training and instinctual behavior. Interesting to read that some breeds or herding dogs are more apt to barking. Kamira Gayle, there are also some dogs who simply enjoy barking for the sheer pleasure of listening to themselves talk or because they are bored. With so many breeds of dogs, there are many reasons why they bark! I have a herding and guard dog (Anatolian Shepherd) and he is extremely talkative. It’s his go to method of communication and I’ve been able to identify at least four different types of barks. He is extremely predictable. The only time I do not like his barking is when we are on walks when he is warning away other dogs, so I distract with training and tricks and reward good behavior. He’s been amazing! I don’t mind when he barks at others from inside the house because he’s just doing his job. It’s instinct. If the corgi’s owner is unhappy she should limit his view of the front, or only allow it when she can work with him on how he reacts.